Pat is a long time North Ender who believes this is the best place in the world to live! One reason she loves it is because there are an abundance of animal lovers all around this area. Pat’s dogs, Penny and Midge, are rescues who Pat says came with baggage. Pat has worked through them with love and patience, mixed in with her gentle alpha leadership they so needed. Pat has had just about every animal as a pet at one time or another…lizards, bunnies, cats and dogs are just some. 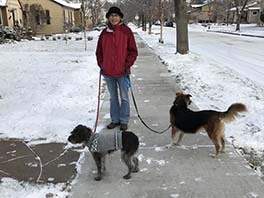 She is an excellent dog walker and sitter who falls in love with many of the pets she cares for. She talks about each one with affection only another animal lover would understand. Pat is honest almost to a fault, and voicing concerns about the pets when they come up. She has great common sense. The clients and we appreciate these qualities about Pat. Pat and Kathleen have been good friends for years and are now a pet sitting team in the North End. Kathleen will often cover the morning visits, while Pat covers the afternoon and evening visits. This arrangement works out great. If you live in the North End, You’ll likely have Pat caring for your pets.